As with any highly anticipated gadget, many rumors concerning the iPad 3 have begun to surface with the release date of this gadget closing in. The rumored release date is set for some time in March 2012 and everyone is hoping that one is true. Some of the rumors floating around are a little hard to believe while others just make us want the product more. Operating System– The current operating system for all of apple products is pretty good as is but that doesn’t stop consumers from wanting newer and better ones. It’s rumored that the iPad 3 will have the iOS 5 system. Currently the iOS 5 is still in the beta testing phase so this may be a little harder to achieve by the release of the iPad 3 but Apple has surprised us with far bigger accomplishments. 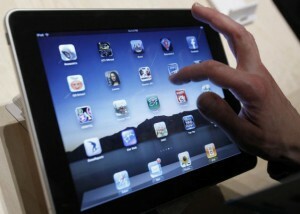 Storage– Apple iPad 2 has 16/32/64 gigs but the next one may surpass that. It’s believed that Apple’s new gadget will also have an option for double the maximum memory we currently have at a whopping 128g storage capacity. There’s also a rumor going around that this device will have a quad-core processor, which would truly be amazing. Name– This is a minor detail that few users will care about once the product has actually been released but for now, many speculate that the iPad 3 will actually be called the iPad 2s. Will the iPads follow the lead of the iPhone’s naming process? Display– Since everyone had their hopes up and expected an amazing display with the iPad 2 but then didn’t get it, it’s believed that the iPad 3 will have the much-awaited Retina Display. As of now, you can only find this type of display in the iPhone 4 and 4s. Retina display is commonly referred to as the “double resolution” because the text and images appear so sharp and clear. However, rumors also have it that installing this display has many challenges, leading us to believe it might not happen again. Battery Life – It’s believed that the battery in the new iPad 3 will be better than the one in the iPad 2, which was very good. The battery life is expected to average 10 hours. 4G- Many believe that the iPad 3 will have 4G technology. This is amazing news but it’s hard to say if it’s true or not. When you take into consideration the current versions of the iPhone, you know that this type of technology is possible. Therefore, having an iPad 3 4G could in fact be a real possibility. Port– By looking at the new Mac books, there is an educated guess that the iPad will have the acclaimed Thunderbolt port that works much faster than traditional ports. Camera and LCD Light– It’s believed that the newest iPad will have a LCD light to accompany the (also rumored) better camera. This will help you shoot pictures in any light just like you can with your iPhone 4 or 4s. Appearance– All of these new features has to be packed in somehow so it’s believed that the new iPad will be a little thicker to make room for all of the extras. All of the rumors going around make the anticipation of this device even more exciting. Hopefully, it won’t be long before we find out for sure what the iPad 3 looks like, especially if the rumor about it releasing in March is true.